For many people, getting their first car is a momentous achievement. Even people who aren't in to cars will still remember what it was and can relate several events to it. The first car can be either something loved or loathed, but the memories it creates last a lifetime. Today, I would like to say why I think that the E36 platform of the BMW 3-seires is the best car to start out life with. First, here is a little background on the car. The E36 was the third generation of the 3-seires built from 1990-2000 as the successor of the E30. It is rear wheel drive, offered in sedan, coupe, convertible, wagon (non US) and hatchback body styles. It came with either inline 4 or inline 6 motors and manual or automatic transmissions. The experience you get from driving it is the main reason. It makes you aware of the road by actually providing sensory feedback in the steering, brakes, and throttle. The noises from the motor intermingle with the feel only further enhancing your drive. The cars don't weigh too much, so having only 200 Horse Power is plenty enough to get you up to speed but not so much that an in inexperienced person can't handle it. They were designed with a near perfect 50/50 weight distribution so that it can be driven through the corners and not just to them. It also doesn't matter what motor it has, the car wants to put a smile on your face. That is what you want from a first car; you want to be involved in the driving process so that you can learn from it and become better at it. You don't want an appliance which only purpose is to get you from A to B in complete isolation as this will only harm your driving skills in the future. 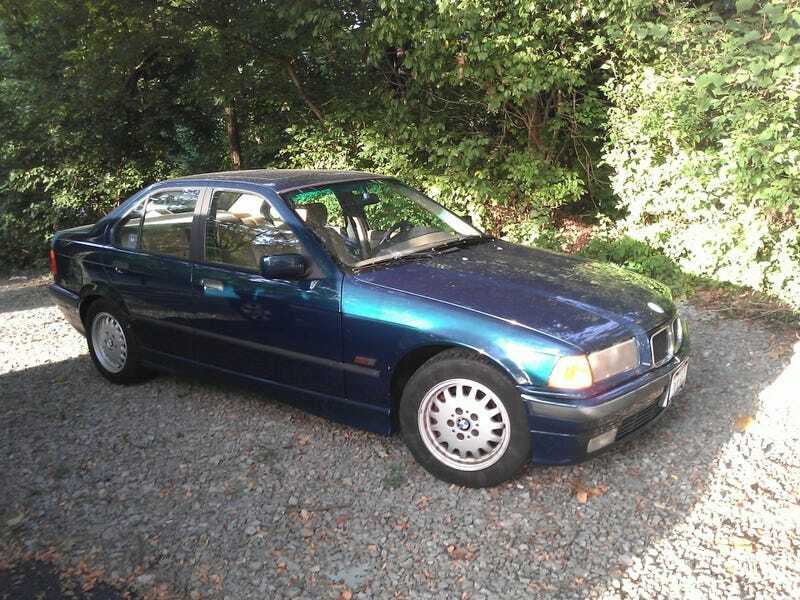 Aside from the actual driving experience, the E36 will deliver you pretty good gas mileage. I have a 1996 328i sedan, which is powered by a gasoline 2.8L Inline 6 cylinder, and I am averaging 26 miles per gallon in very mixed highway and city driving. This isn't from hyper milling or driving for maximum fuel economy either. Despite being a "sub compact," there is plenty of luggage space and room for four people comfortably and 5 in a pinch. With the back seat folded down, a full sized mountain bike can fit in with the front wheel removed and there is still enough room for bags and back packs. As for pricing, today, you can pick one up for prices ranging from under $1,500 to $15,000, depending on model, options, and condition. Now, there are drawbacks to owning a 1990's BMW. The E36's cooling system is a big one, but it can be easily fixed for not a lot of cash, as parts surprisingly not too bad on the wallet. There are, of course, other things that may go wrong. I think that having to work on a car only helps build strength for the owner. You need to learn how to take care of a car to avoid very expensive repairs later on in life. Things like how much oil you have and what it smells and looks like, same for coolant and other fluids.